T: Add R or W to your mana pool. The issue with the artifact lands is that there is enough artifact hate out there that adding them to help just one instance of metalcraft seems not worth it. If you were running Mox Opal and a few other effects, sure, however here the reward doesn't seem to match the risk. Not to mention its for a card which just helps equip costs and by the time you're actually going ot be playing and equiping stuff where it's actually relevant you already have metalcraft. For Boros Garrison , it's fine if you want to run a crad because you like the art or the flavour. But overall the ravnica bounce lands are detrimental in the vast majority of decks. In opposition to what was said, you can't count them as two lands. They are at best a land that taps for two mana, however for most decks the drawbacks are significant enough not to run. The issue with them is not that they don't do anything the turn the come down but that they negate turn two especially. Turn two for most decks is where they start pulling ahead. A majority of ramp spells are 2 CMC and they completely undo your second turn. Even with a Temple of Triumph , you could play it turn one to have access to two mana on your second turn. But you can't do that with the ravnica bounce lands. And on top of that, they aren't ramping either. Ancient Tomb gives you +1 on your pool at the cost of life. These cards don't. The only time they could be somewhat useful is if you're struggling to hit your third land. And in that case, you should be aiming your ramp to be 2 CMC rather than 3+. Yes, solemn gives you a card when it dies, but a skilled oppoennt will understand opportunity cost. "I could not attack and they won't get a card, but that completely delays my strategy. Or I could attack, give them a single card and work towards killing them". If your opponent isn't going to attack because of a Solemn, chances are they aren't going to attack because of a few tokens, which will do much more work in the long run. 8/9 ramp pieces is not a good amount of ramp. Especailly with a 6 CMC commander and a curve peaking at 4 CMC. You should be aiming for somewhere in the 15 ramp card effects, with a bunch of them being 2 CMC (or less if you can). If you were running 14 other ramp cards and had Solemn, I would say that's fine. But with a relatively low amount of ramp and having a bunch of expensive (read 4 CMC) ramp cards, I would say that you need to slim your curve. While yes, anything less than 5 mana technically ramps into your commander, the cheaper it is, the more of them you can chain together. Because assuming you're hitting your land drops, playing two 2 CMC rocks on turns two and three will net you a turn four commander, while playing a single Hedron Archive on turn four will net you a turn five commander. That's why in general slightly weaker but more ramp is better than less ramp which is more powerful. You cna curve that of course, but the majority of your ramp should be cheap to play. The beauty of running more ramp as well means you can get some serious value from cards like Bludgeon Brawl late game to turn all your rocks into Bonesplitter s.
The idea of in a relatively low ramp deck going and cutting cheaper cards for more expensive ones seems ridiculous to me. I get that yo uwant to have a way of closing games out, however fattenign up your curve is the exact opposite of what you want to do. This just in general slows your gameplan and more than that can make many hands unplayable. Most curves want to have the vast majority of cards in the 1-3 CMC slot and taper off as they get higher up, regardless of playstyle of the playstyle of the deck (for commander at least). Adding a bunch of high end bombs seems counterintuative. Not only are they harder to cast, they draw more hate and are easier to deal with. The better way of closing out games would be to design the deck so that cards get more powerful as they synergise with other cards in the deck. For example, running a bunch of tokens and then using cards like Mikaeus, the Lunarch , Cathars' Crusade , etc. means that rahter than your opponent beaing able to play any single point removal spell to deal wit hyour threat, all of a sudden you have a bunch of creature that they have to deal with. Higher synergy decks will always be more powerful on average than decks which just run a bunch of curve fattening bombs. 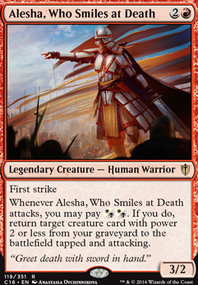 this is one of the few things I will agree with DespairFaction on, cards like Archangel of Thune would do well here given the token production that you have. And you don't need lifegain. Angel connects, you gain some life and make all your creatures bigger for next turn. As far as finishers go, this is actually a good ome. Cheap mana cost, flier and adds value to the rest of your board. 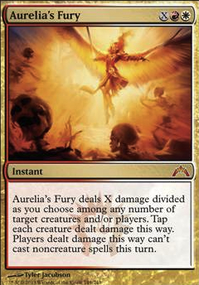 I think that Sublime Archangel isn't a bad fit here, she keeps the curve down and can help close out games by leveraging smaller tokens which trade unfavourably. Anyway, that's my two cents on the matter. Please don't interpret this as a personal attack - I get that deckbuilding is a very personal thing (for the most part) and I don't want this to come across as belittling. I do however know from both a lot of personal experience and a lot of discussion with many players from across the specturm of casual and competitive that there are some concepts expressed which will ultimately hold the deck back. And if you're ok with that then that's entirely cool. But there are some fairly obvious standouts in both card choices and reasoning which I think is worth offering some counterpoints to. Hello! My suggestions: -2 Temple of Triumph, +2 Unclaimed Territory, -3 Honor of the Pure, +3 Radiant Destiny, -2 Tajic, Blade of the Legion, +2 Tajic, Legion's Edge. And I would recommend to think about 2 copies of Heroic Reinforcements. You should really consider playing better lands, while boring lands are the key to making a deck flow. I'd suggest Inspiring Vantage and Clifftop Retreat, if you don't want to buy into those then a cheaper (though less efficient) solution is Terramorphic Expanse or Evolving Wilds, or you could try Temple of Triumph. Have you considered Boros Signet, Worn Powerstone and Gilded Lotus? Heartless Hidetsugu is game over if Gisela, Blade of Goldnight is out. Furnace of Rath, Dictate of the Twin Gods and True Conviction are great for beatdown. Boros Charm is really versatile in this deck. You can swap Take Vengeance for Swords to Plowshares. Sunforger is the greatest card in Boros and can grab any instant at 4 CMC or less. 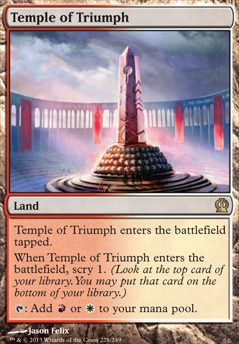 // It's good to run Command Tower, Battlefield Forge, Temple of Triumph, Needle Spires, Ancient Amphitheater, Boros Guildgate are good for mana fixing. Slayers' Stronghold, Sunhome, Fortress of the Legion and Rogue's Passage are good for combat tricks; Mistveil Plains brings recursion; Spinerock Knoll is great at cheating costs; Secluded Steppe and Forgotten Cave for card selection. // Revitalize, Lightning Helix, Demystify, Fountain of Renewal are subpar in this deck. You might want to add Champion of the Parish. I would also take out Heavy Mattock. Just because it synergises with humans doesn't mean there isn't something better out there. Your manabase could also be edited if you don't care about budget. You could add Clifftop Retreat, Rugged Prairie, Needle Spires, Temple of Triumph, Battlefield Forge, and Sacred Foundry. 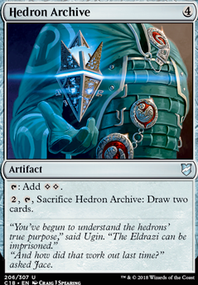 You have no card draw, which can't be helped very much as boros, but try adding things like Mind Stone, Hedron Archive, and Commander's Sphere. I didn't see any boardwipes, which are crucial, so definitely add those. Fated Retribution, Cleansing Nova, and Citywide Bust are a few.